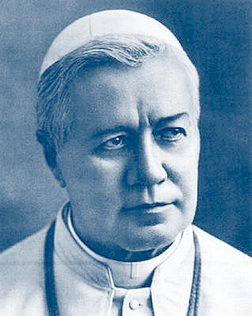 OPE PIUS X was known above all for his humility and poverty. There are hundreds of stories that illustrate this. For example, as a young child, he often carried his shoes on his back during long commutes to and from school. This was to prolong their life, since shoes were expensive, and his family was extremely poor. Even after becoming Pope, his devotion to Apostolic poverty was extreme, bordering on imprudence. Any man can be elected Pope. As the good Father Leslie Rumble reminded us, Pope Leo XIII was a Prince by blood, whilst his immediate successor, Pope Pius X, was the son of a poverty-stricken mail carrier. In 1882 as Vicar General of Treviso, Mons. Sarto personally participated in the Gregorian Congress at Arezzo, which passed resolutions affirming the problematic nature of the then papally privileged Regensburg Medicaean edition of the chant, and calling for a revival of the traditional liturgical melodies along the lines which Dom Joseph Pothier, O.S.B. had sketched out in 1880. Named Bishop of Mantua (which at that time was beset with many problems), Sarto began in 1884 to teach dogma courses in the Seminary, giving each student a personal copy of the Summa Theologiae. He also personally conducted chant rehearsals for the students, so that the Mass chants would be sung correctly.